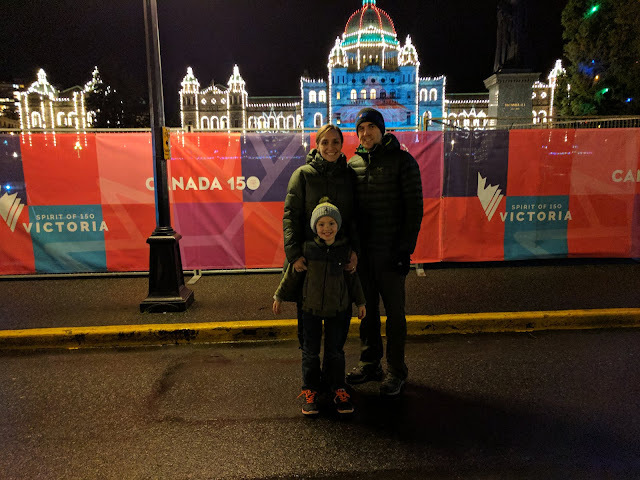 Over the long New Year's weekend we made a trip to Victoria. 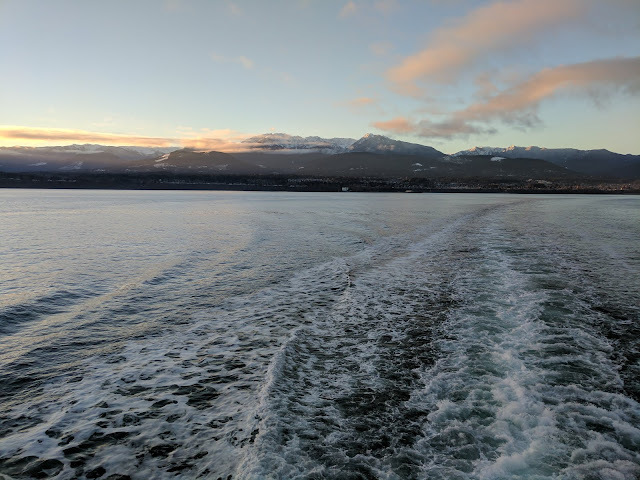 Although the distance between our house and Victoria is less than 200 miles, the island is not connected by any bridges so you must use at least one ferry to get there. We woke up super early, drove to Port Angeles and loaded onto the ferry. We said goodbye to Washington and the US right as the sun began to rise. Victoria is the largest city on Vancouver Island, but only encompasses a small section of it. Since the island is so big, cars are needed to really explore and many of the ferries allow cars as well. Adam and I had taken cars on ferries in Croatia, but this was a first time experience for Mom and Landon. I have to admit, I was even surprised to see semi trucks onboard as well. 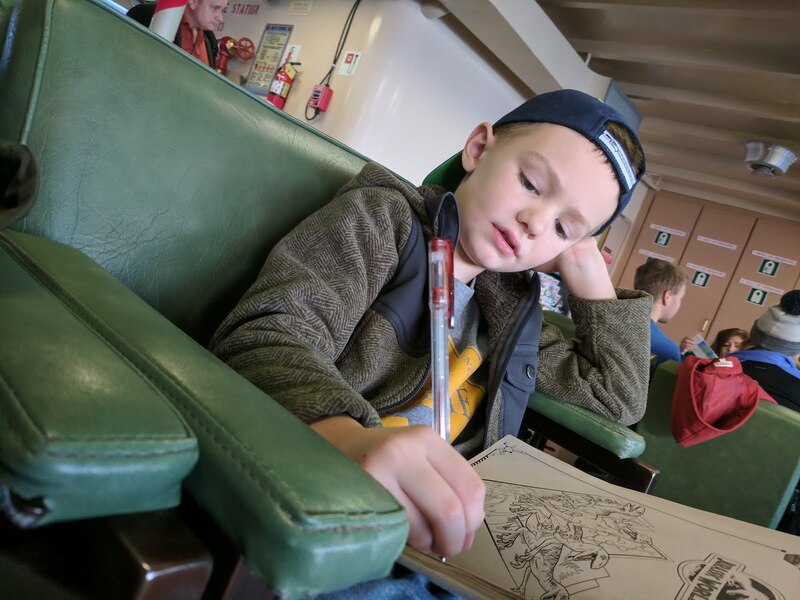 The ferry ride was a breeze, some of us colored while others caught up on some work. And in no time we were arriving in Canada! It wasn't even 8 AM and we were ready to explore! We headed off to our first stop, passing the famous parliament building right along the way. Our first stop was De Detuch, a local dutch pancake chain I discovered in Vancouver in June. Probably overlooked by most visitors, but that is a real mistake. Their dutch pancake, the pannekoeken is spectacular and comes in so many variations! I just had to share this treasure with Mom. Of course, she loved it too! We both got the strawberries and cream although in hindsight we should have ordered different flavors and shared. And despite our best efforts, neither of us were able to finish ours. Completely stuffed, we headed over to Beacon Hill Park to keep ourselves from entering a food coma and to enjoy the beautiful sunshine. I heard great things about Beacon Hill Park, but it was even prettier and more enjoyable than I imagined. There was a number of ponds and tons of ducks walking around from person to person to get some food. 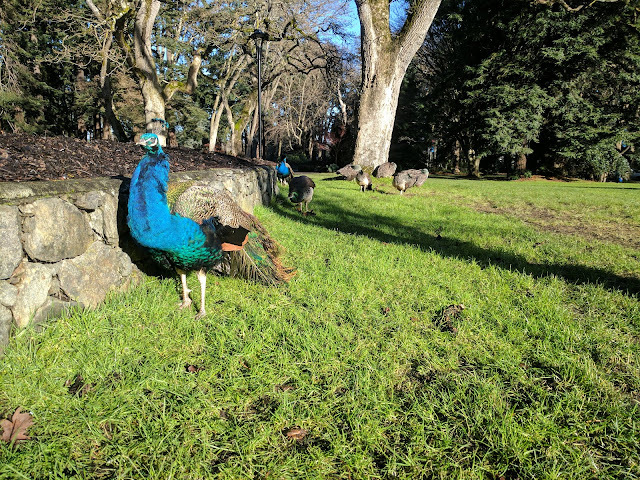 The park didn't just have ducks, but a lot of resident peacocks as well. I had never seen peacocks in a park, much less so many and in a natural habitat. Landon just couldn't get over that the males are the prettier of the two sexes. He was sure we had that all wrong. At one point, a peacock flew in front of me and I realized he had come from a large tree. I looked up and sure enough, about three peacocks were up in this massive tree roosting. I didn't know peacocks could fly, much less roost in a tree. And these were not the only birds we saw in the park sitting high up. We came across the world's tallest totem pole which was 127 feet tall. Perched right on top, enjoying the view was a beautiful bald eagle. I'm sure Native Americans would claim it was a spirit. I think he was just picking the highest spot to search for his next meal. Either way, on our way back he was gone so although the picture is hard to make it out, it was really neat to see. The park has the largest and most beautiful trees. It also extends out to the water, which in this particular area is the Straight of Juan de Fuca. We walked down to the beach to take in the water views. This part of the park is a dog-friendly area and seeing all the dogs running around, having a blast made us wish Kaiser was with us too. 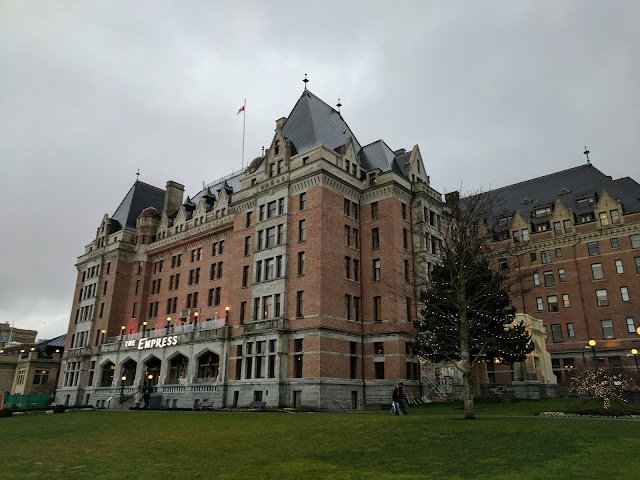 It was a little cold to spend too much time on the beach, but I made a note to come back to Beacon Hill Park when we visit again in the Summer. It was so enjoyable on that sunny winter day so I can only imagine how easy it would be to spend the whole day there when the weather was warm. 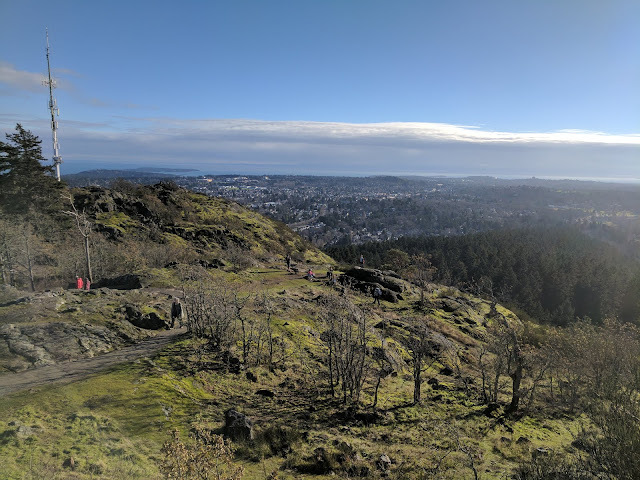 After we had finished walking the park, we made our way up to another park, Mt Douglas, for some commanding views of Vancouver Island and beyond. We drove all the way to the overlook although many people were parking at the bottom and hiking all the way up. The views from the parking lot were amazing! 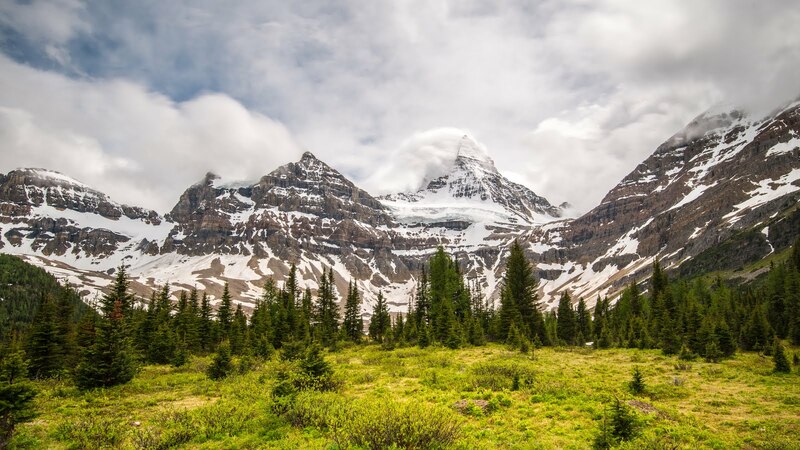 It was just a short walk up to the top and the views just kept getting better. And better. At the top of Mt. Douglas is a view with 360-degrees of beautiful Vancouver Island. Totally worth the extra stop and little walk. Having gotten up so early, we decided to make an early day and headed to our rental for the weekend. 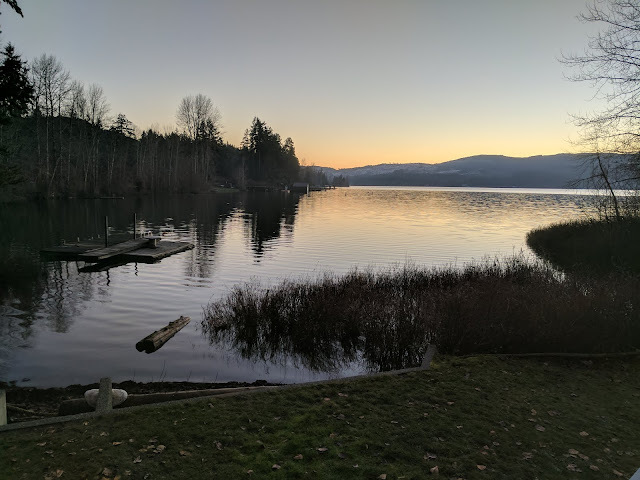 Adam found us a house on Airbnb which was located outside of Victoria on Shawnigan Lake. We arrived just before sunset. It was such a peaceful place to be. We woke up the next morning and headed out. Despite having a full house, we didn't have much food with us so we started looking for a breakfast spot as we drove back into Victoria. I found this well-reviewed cafe on our route and we decided to give it a go. It ended up having the BEST breakfast and the most commanding views. It was totally unexpected and the lack of expectations always enhances great experiences. The Malahat Chalet is a restaurant and lodge and we will be sure to come back for at least one night on our return trip. 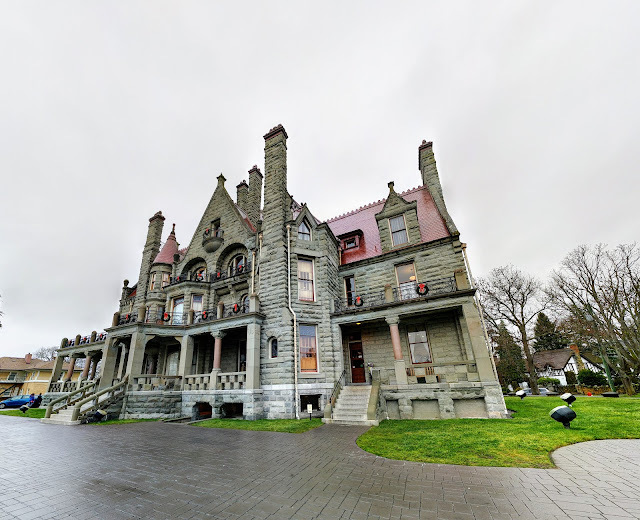 After breakfast, the weather was a bit rainy so we decided to check out a historical home in Victoria known as the Craigdarroch Castle. 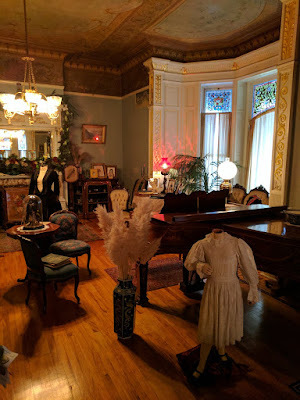 I really enjoy touring old homes, but I realize it isn't for everyone. Bless the castle for realizing that kids would fall into the later category and having an activity for kids to do. This wasn't our first house tour with Landon, but I think the activity made it his favorite. 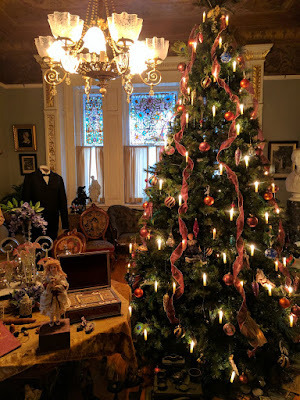 It was an I Spy throughout the house that followed the tour. Landon really enjoyed going from room to room finding the different little items. I just love it when places try to involve kids. The most stunning part of the home was a beautiful wooden staircase which climbed all four floors to the top of the home. 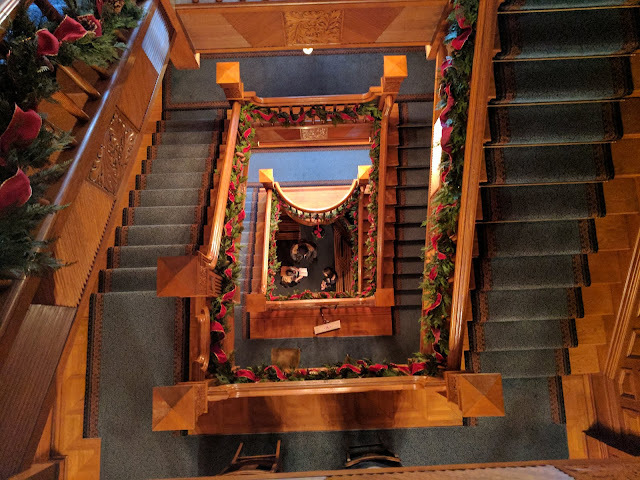 On the landing of a second floor, a classical guitarist played Christmas music which filled the entire house. Many of the rooms were decorated as they were in the 1890's when the family made this their home. We enjoyed every room and learning about the Craigdarroch family, the most surprising item in the house was the brass fireplace in their smoking room was made in Louisville, KY. Sometimes the world seems so small. After our tour of the house, we made our way towards parliament hoping to take a tour of the beautiful building. Unfortunately, as we tried to enter, we were told the parliament building was closed for New Years and wouldn't reopen again until Tuesday. Instead, we walked around the area and the harbor. We walked up and down the streets and did a bit of shopping. A certain little someone managed to squeak out with a new hat. We even made our way into the famous Empress Hotel to have a look around. The Empress Hotel sits catty-cornered to the parliament building surrounding the harbor and makes for an impressive scene. It was New Year's Eve and we realized most of the nearby restaurants would probably be booked for dinner so we took an early dinner at an Irish Pub. 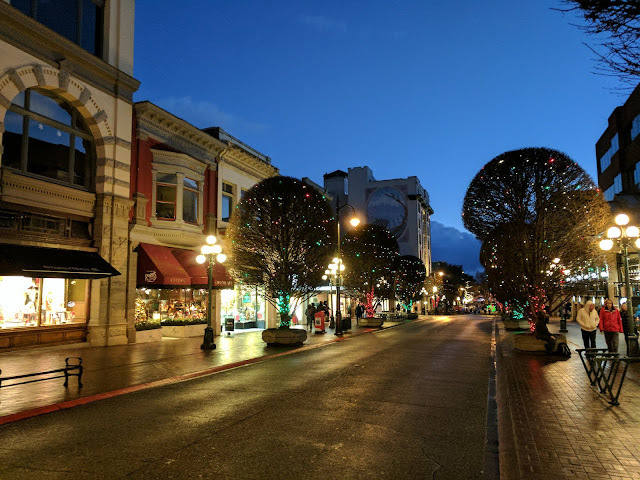 When we left the restaurant, it was just beginning to get dark and the Christmas lights were just starting to come on. With a little more time to kill, we took in an Imax movie. 2017 represents the 150th anniversary of the Confederation of Canada and they kicked off the celebration on New Year's Eve with parties across the country. 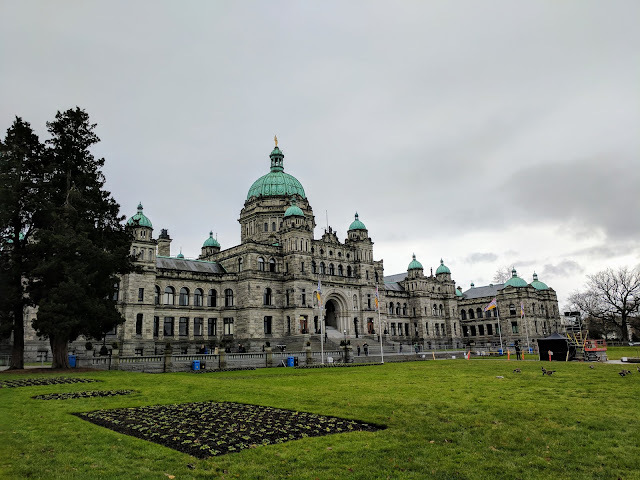 One of the places with a large party happened to be Victoria. By the time we left the IMAX the harbor was all light up and the celebration was beginning. This city dressed up in Christmas lights was amazing! Even the boats in the harbor were on display. It was beautiful! The parliament building is commanding during the day, but beautiful at night all light up. 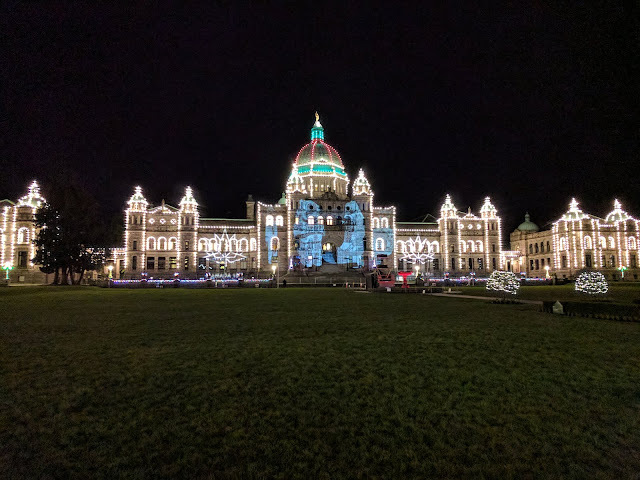 I'm told it is lit up all year long. 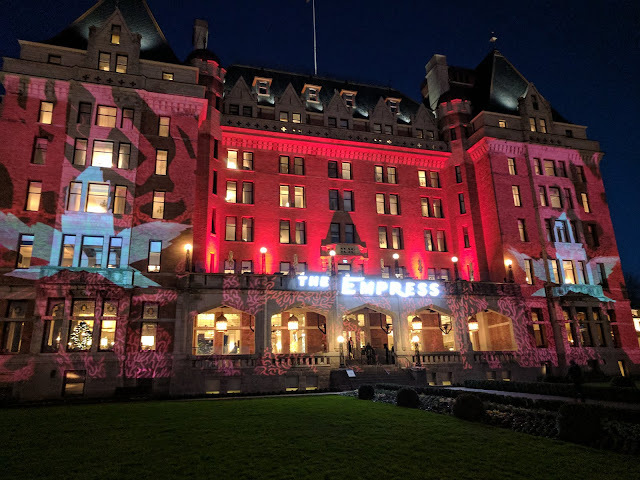 The Empress Hotel was lit up as well. 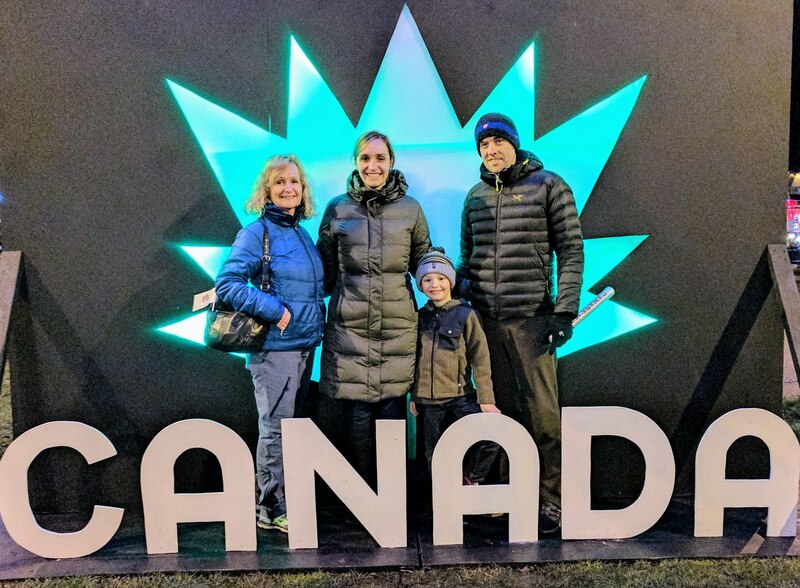 We walked around enjoying the lights, got some hot chocolate, and danced to the music while waiting for the fireworks to begin. The best part of their celebration was that they were timing the fireworks it in conjunction with the 19 other cities in Canada. So instead of having the fireworks at midnight, they were scheduled on EST time which was 9 PM for us. 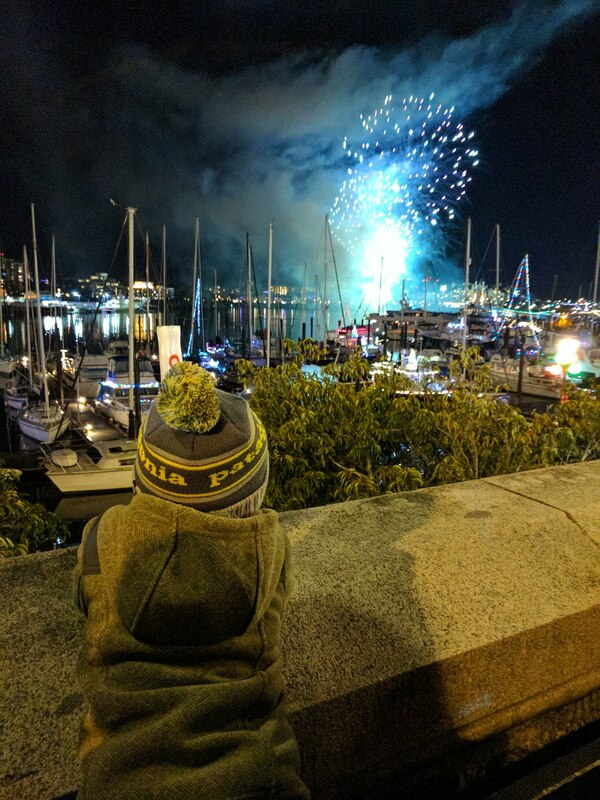 It worked out perfectly for people with kids and we got to ring in the New Year early enough that we all could actually enjoy it. Needless to say, we were all asleep before midnight actually struck, not that we minded. Canada did New Year's well, we had so much fun! And it wasn't over just yet!